Asp.Net, C#.Net, Angularjs, Entity Framework, JQuery, MVC, Interview Question: How HTTPrequests work in IIS ? There are Step by Step processes to know how HTTP request works. 1. If want to be able to interact with the low level processes, such as how the web server processes incoming & outgoing HTTP Request. 2. Before coming of HTTP Modules and Handlers to work with Web server & to control IIS operation uses forced to create ISAPI Extreme or Filter. Which is not easy due to creating it user need to know about c/c++ knowledge in low level. 3. IIS is the basic end point for incoming HTTP Request its job is to listen for & validate incoming HTTP Request. Than it routes them to appropriate modules for processing & return any results to the original requestor. ASP.net is one of the modules that IIS may pass request to for processing. 4. 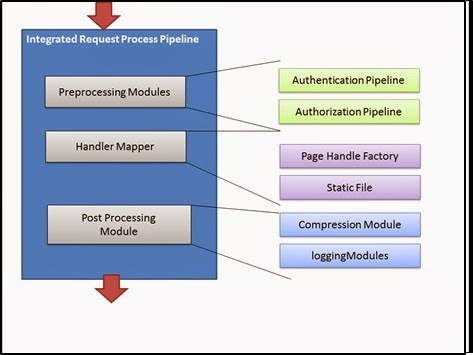 IIS 5/6 & ASP.net : IIS treats ASP.NET as one of the modules that it can pass request to for processing rather than as an integrated part of the iis request processing pipeline. 5. Handler and Modules using managed code, they are isolated context if the ASP.NET process. TO integrate with the IIS pipeline you are forced to create modules using native code. 6. IIS 7 and ASP.NET – request processing pile in ISS has been completely re- architected using as open and highly extensible based module system. Now in IIS 7. 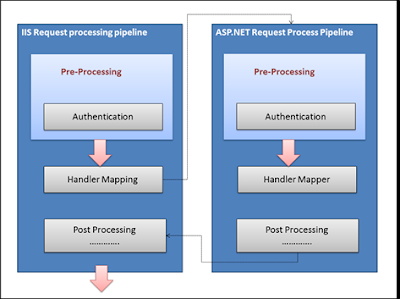 Instead of seeing ASP.NET separate entity ASP.NET has been deeply integrated into IIS request processing pipeline. Now there it eliminate duplicate processes and allow you to integrate managed modules in pipeline. 7. ASP.NET is first class citizen; so we can place than at any point in the pipeline in IIS7 & even we can put our custom functionality. 8. ASP.NET request Processing: Regular of any IIS version, HTTP request model has two core mechanisms for handling requests. Evan ASP.Net use this two modules to process the request generate a response and return that response to the client and this is HTTP Modules and HTTP Handler. Any of the ASP.net application for authentication of Inbox caching of ASP.Net. We have several different HTTP modules. Evan some easy application of “Hello World” to view in browser. HTTP Handler required, it listen the request and process and render aspx page. 9. There and multiple HTTP modules but single HTTP handler.